The New York Times today interviewed psychologists and therapists about the jarring changes in their daily practices in the wake of the September 11 attacks. Dr. Seeley spent the better part of two years conducting in-depth interviews with 35 therapists who had worked closely with 9/11 survivors and families. 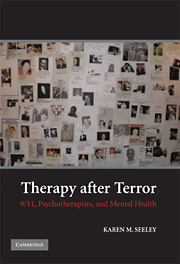 They formed the basis for a book called Therapy After Terror: 9/11, Psychotherapists and Mental Health and published last year by Cambridge University Press. What she learned was that the pros in her field not only were ill prepared for the disaster but also became overwhelmed by the horrific stories that they heard and by their own terrorism-induced anxieties. Obviously, victims’ families suffered most. But all New Yorkers were traumatized to some degree. Their city had been attacked. As the country entered a constant state of war, they were told by political leaders to be afraid. Many were.